I’ve had a slight obsession with peaches this season. I think it’s because in the past I was never a big consumer of fruit, and in the last 12 months I’ve rediscovered all of it! I've also taken a strong liking to nectarines and apricots. Actually pretty much all stone fruit, to the exception of plums - they are still too sour for me. I also have a slight obsession with Donna Hay’s new book Seasons. It’s just so lovely! I bought this book a couple of months ago, lent it to my mum, then had to buy another copy for her. All the recipes have photos (a big plus), and they all look delicious, rustic, and comforting. 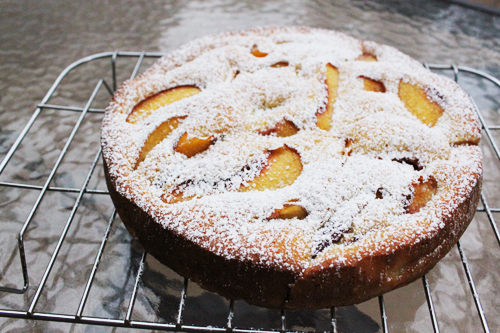 So here’s another recipe from the book, Lemony Peach Cake. This cake, like the Peach & Raspberry Tart, is simple and delicious. I could have eaten the batter itself it was that good - who am I kidding, I ate a decent amount of the batter. It was light and fluffy, but moist, and stayed good for three days, up until I ate the last piece! Only side note is that I used 2 peaches instead of 3, as my peaches were very large. Preheat the oven to 160C. Line a 25cm round cake tin with baking paper. In a bowl, add the butter sugar and lemon rind and beat with an electric mixer until light and creamy. Add the eggs one at a time, beating in between. Add the flour, baking powder and yogurt and continue beating until combined. Pour the mixture into the baking tin, and top with the sliced peaches. Bake for 1 hour or until a skewer comes out clean. Allow to cool before turning onto a wire rack. Dust with icing sugar and serve with cream. I have this in my oven as I type! Can't wait to try some...yours looking amazing.